CityShopDeals Automobiles Bangalore BangaloreAutomobiles Delhi DelhiAutomobiles Hyderabad HyderabadAutomobiles Mumbai MumbaiAutomobiles Hyundai amazing Catch your match Offer special Offers |April 2016 Ugadi festival discount offer. 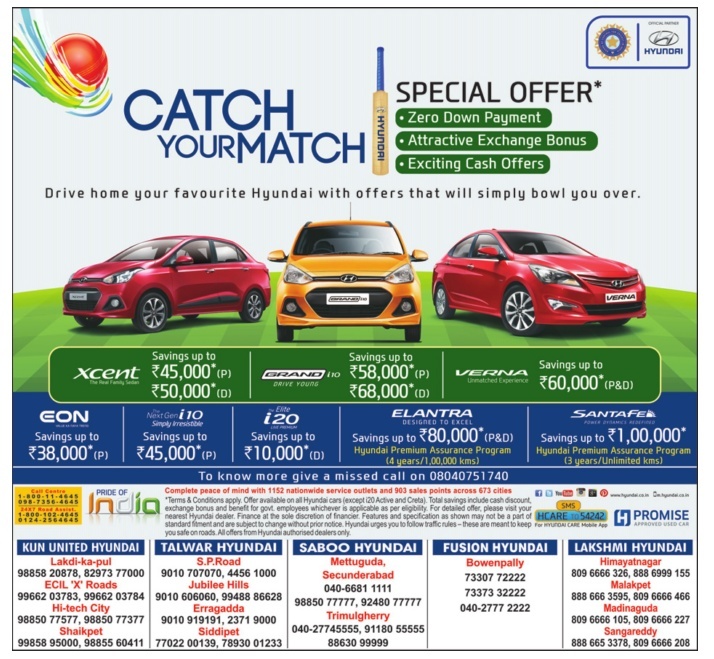 Hyundai amazing Catch your match Offer special Offers |April 2016 Ugadi festival discount offer. Hyundai special offers. Zero Down payment, Attractive exchange bonus, exciting cash offers. Discount Offers applicable on xcent, Grand i 10, Verna, Eon, i10, i20, Elantra, SantaFe. To Know more, give missed call on contact 08040751740.